DT Register supports 20+ payment gateways by default plus additional payment gateways built as seperate plugins. To create new payment option, access Pay options panel and hit the add new button. Pay Option Owner: Select the owner of this set of payment options. This is the user who will have access to edit these options and also use them for their events. Global Pay Option: Check the box if you want to designate this set of payment options as a Global setting. If it is global, any user will be able to use it, but not able to edit it still. Payment Option Name: Give a name for this set of payment options. This will show in the event setup to choose which payment option to use per event. Select Default Currency: This default currency is what will be used for payment transactions. Select Default Currency: Select if you want to use a comma (,) or dot (.) as the separator in the displayed amounts. Or select NONE if you do not need to show any decimal places, only whole amounts. Live/Test Mode: Select if you want to run registration in Live or Test mode. This parameter will apply to all payment options except for Pay Later. Payment Methods to allow: Select which payment type(s) you will offer. 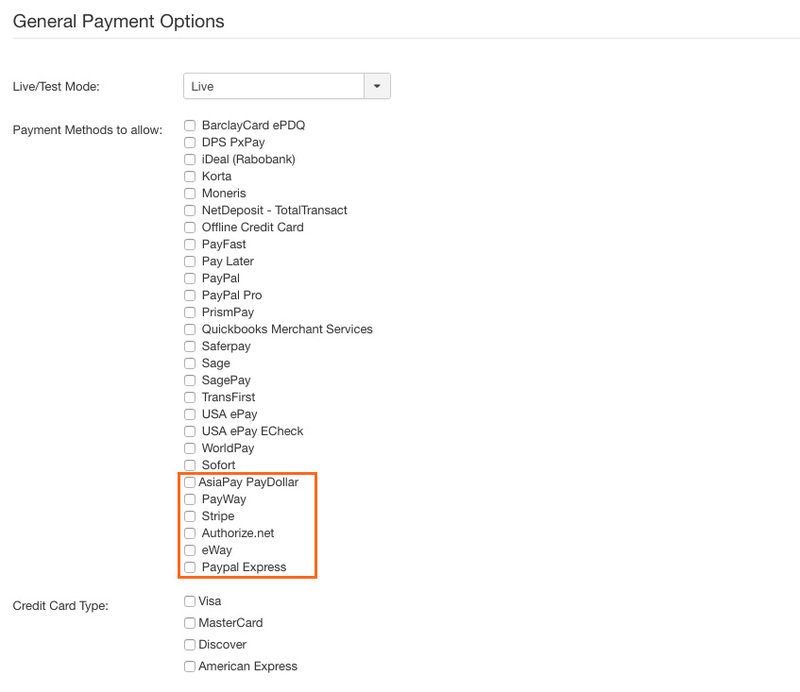 When you check the box to select a payment option, the parameters for that gateway will show below. CURL Processing: If you are having a problem with processing payment through a gateway that uses CURL (like Authorize.net), try using an alternate method here. Method 1 should work with most everyone, but some servers require Method 2. These are most often older GoDaddy hosted accounts. NOTES for ePDQ: BarclayCard ePDQ is a payment gateway for United Kingdom merchants. Find out more and setup an account at www.barclaycard.co.uk/business/. In your account settings, go to the Technical Information page -> Transaction Feedback tab and make sure to check the box that says "I would like to receive transaction feedback parameters in the redirection URLs. ePDQ PSPID: Enter your affiliation ID for your BarclayCard ePDQ account. NOTES for DPS PxPay: Get more info at http://www.paymentexpress.com. NOTES for Korta: Korta Web Payments (KWP) is a payment gateway based in Iceland that supports multiple European countries. Get access to your account and more info at: http://www.korta.is. NOTES for MONERIS: Moneris is a Canadian based credit card authorization service. They will assign the store ID and key needed to configure the gateway definition. NOTES for NETDEPOSIT: Net Deposit - Total Transact allows you to take credit card payments directly on your website. There is no redirect to another site. NetDeposit is formerly known as ModPay or Modern Payments. NOTES for OFFLINE CARDS: This offline payment option allows you to collect credit card details during registration, but NOT process the payment online. Payment details are stored (encrypted) and then visible when viewing the record in the record management. You can also include payment details in the admin email using the [OFFLINE_PAYMENT] tag. PayFast Merchant ID: Enter your PayFast Merchant ID number. For test mode, use 10000100. PayFast Merchant Key: Enter your PayFast Merchant Key. For test mode, use 46f0cd694581a. NOTES for PAY LATER: Pay Later is for offline payment processing. Select the options you want to use on the left. You can change any of the option labels, and can add or remove options also. Pay Later Options: Select the Pay Later options you want to offer to users by checking the boxes. You can add or remove pay later options and can edit the text label of existing options. Pay Later Conditional Field Option: This is an optional way to trigger the Pay Later payment option. First, you must have it selected above as an offered payment option. Then if you want this Pay Later option to show ONLY if a specific selection is made in a field, then you can do that here. Choose the field to make this payment option based on, then select the field value(s) that must be selected to offer Pay Later as an option. NOTES for Paypal: You must have Instant Payment Notification (IPN) enabled in your PayPal account for registration records to be created properly. To do this, login to your PayPal account and go to Edit Profile. Under the "Selling Preferences" column, click on "Instant Payment Notification Preferences". The next screen will show if this is On or Off. To turn it On, click the EDIT button. Then check the checkbox and then input a url in the Notification URL box. DT Register actually has the necessary URL coded in, so it doesn't matter what url is input here. If nothing is there, just type in your website URL including the http:// on the front. Also, in other settings, you must have Auto-return set to OFF. NOTES for QBMS: The place to go and register an application and acquire the App details needed is http://appreg.intuit.com. 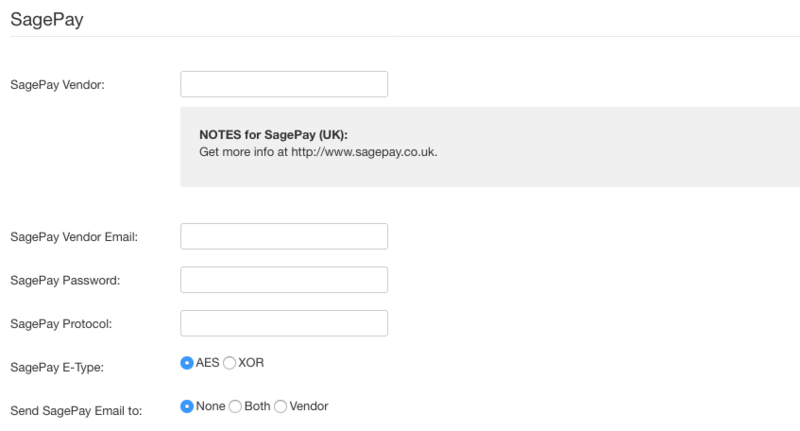 NOTES for SagePay (UK): Get more info at http://www.sagepay.co.uk. NOTES for Sofort: Sofort Banking is available in 11 European countries and allows you to accept online banking payments. NOTES for TransFirst: TransFirst (Transaction Central) is a payment gateway used within the United States. Get access to your account and more info at: http://www.transfirst.com. NOTES for USA ePay: You should have a SSL certificate on your site when using USA ePay as the payment process is done entirely within your site. ePay also has an option for ECheck payments. NOTES for WorldPay: WorldPay is a payment option for the United States, Europe and Australia that redirects users to a secure external site for payment. For this to work properly, you must go to your WorldPay account and enable "Payment Response". For the "Payment Response URL". 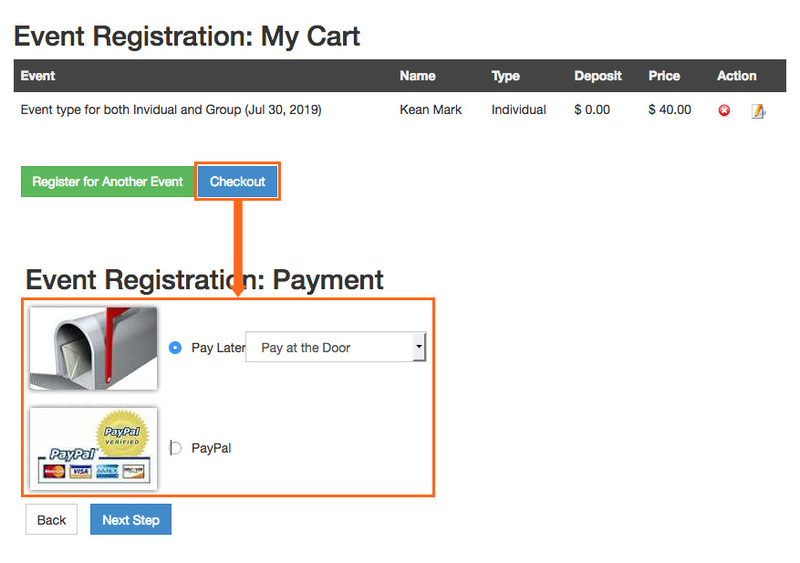 In front-end, when user register an event, in the checkout step, they can select the payment gateways to pay. Admin can assign specific payment option to specific event. In the event editing page, open the "Discounts and Fees" and assign the paymention option you want for the event in the field "Select Payment Configuration"
Besides the default payment gateways, DT Register supports more payment gateways, each payment gateway is built in seperate plugin. 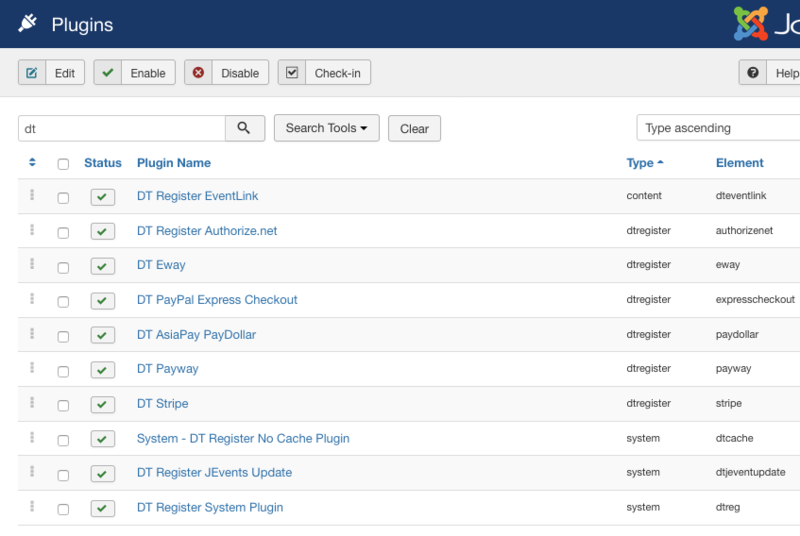 To download the plugin, access the DT Register Add-ons download page to download. Install the plugins as normal Joomla extension installation. Once done, enable the plugins in "Extensions > Plugins"
To configure for the payment gateway, open corresponding plugin and do the setup in the Advanced Settings tab. Now, you can create Payment option for the payment method. Go to "Components > DT Register > Pay Options" and add new pay option. In the "General Payment Options" section, you will see the new payment methods are available to select.